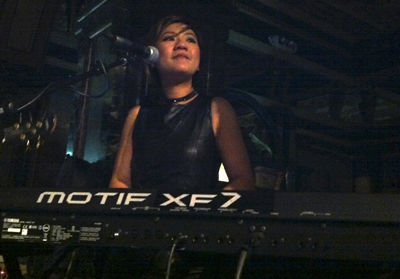 Recently seen touring nationally on the GET ALONG shows with Guy Sebastian, Wendy Anggerani is a highly sought after pianist and keyboardist who has shared stage with many great artists such as Ronan Keating, Josh Groban, David Campbell, Jessica Mauboy, Darren Percival, Paul Gray from WaWaNee and Eric Weideman from 1927. She was also the deputy keyboard player for Sydney's production of Jersey Boys. She's been involved in many shows such as X Factor, Sunrise on Channel7 and A Night at The Rock Opera in State Theatre. In 2007 Wendy toured around China and South East Asia. She performed with Asia Beat's Lewis Pragasam in Malaysia and Indonesia at The Java Jazz Festival. Wendy is currently involved in original projects with Wendy Katz and SSJ. Born in Indonesia with Chinese heritage and came to Sydney in 1999, Wendy completed her Bachelor of Music at The Australian Institute of Music. Apart from touring and recording she is completing her Masters, specialising in the synthesizer.